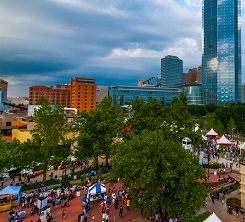 Known as Oklahoma City’s annual “rite of spring,” the Festival of the Arts is a six-day community celebration of the visual, culinary and performing arts. Come to the Festival of the Arts to view the creative works of over 140 artists from across the nation. Also enjoy a large-scale Sculpture Park exhibit on the Stage Center Lawn. The Festival of the Arts is famous for its International Food Row. Sample delicious ethnic food or stay with tried-and-true festival favorites. From scrumptious Indian tacos to heaping platters of Brazilian food and Mexican cuisine, the festival’s food row will leave everyone with an appetite satisfied. Enjoy four stages of nonstop performing arts and entertainment, as well as street performers roaming the grounds. Nearly 300 entertainers of all ages will donate their performances at the Festival of the Arts. In addition, hands-on activities will be available in the festival’s children’s area for $2. The Young-at-Art Mart returns as the children-only shopping venue with all artwork affordably priced for $5 or less. Families can also enjoy face painting and visit Pottery Place and Creation Station for more fun.